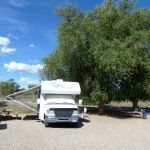 Ask fellow campers about "Sundance RV Park" and nearby attractions. A small and very well maintained park. The roads are wide and the campsites are easy to get in and out. There is gravel throughout the park (on the sites) and the main road is asphalt. The showers, bathrooms and laundry room are very clean. The utilities are in great shape at each site. There is a "dog area" if you need and they have recycling containers at the front of the park. They are redoing the Internet but went out of their way to help me get a connection when I was having trouble. The service from entry to exit is great. We would stay there again. We camped at Sundance RV Park in a Travel Trailer. This is a great central location for Mesa Verde and Canyons of the Ancients. The town is large enough that you can get anything you need, yet small enough to get in and out within a few minutes. There are some great drives around. We suggest you check in with the "Welcome Center" that is located across the street from the park. Fairly quiet for an in-town location. Wifi was not working. We had a "satellite friendly" site. We camped at Sundance RV Park in a Travel Trailer. Nice spacing for a private park. Dog area could use fencing so they have an off-leash space. Asphalt road in good condition. Gravel pads are level. We camped at Sundance RV Park in a Motorhome. Big rig friendly with level sites. Easy on/off to highway. WiFi, laundry, and showers were good. No dog park but two walking areas with bags to walk dog. Cable was good and no problem with satellite. We camped at Sundance RV Park in a Travel Trailer. Walmart and downtown was 1 miles. Walking distance to a restaurant. Nice place for an overnight stop. Utilities worked well and located in the proper area. Site are level and fairly close to each other. We camped here in a 40" motorhome. We camped at Sundance RV Park in a Motorhome. Small but immaculate park. Great location for visiting Mesa Verde. The camp host was the best camp host I've ever met in 8 years of RVing. We camped at Sundance RV Park in a Motorhome. Very, very nice campground. Located right in town so it's easy access to Walmart and restaurants. Staff is super friendly and very helpful. Roads are paved and the sites are all gravel. Our site was a pull through just long enough for our motorhome but plenty wide enough to park our car at our site. Can't say enough about how nice the staff are that work there and how clean they keep the grounds. Definitely a great park. We camped at Sundance RV Park in a Motorhome. If you love Mexican food you need to try Tequila restaurant. Excellent food and service. Jack and Janelle country cooking restaurant right next-door to campground, they make a great breakfast. Very clean park with pull thrus and back ins. Check in was quick and easy. Pulled into a our mostly level site. We had a grassy area for the pooches. They do have a dog walk area but it is not fenced. They have a central restroom and laundry area. Most sites are not satellite friendly due to the trees. We did pull all the way up to the very front of the site and was able to pick up satellite. But, it made us very far away from the water and sewer hookups. You can walk to grocery shopping and restaurants. Close to Mesa Verde National Park. We camped at Sundance RV Park in a Motorhome. Stop by Pippo's Cafe downtown. Really good food at a great price! Mesa Verde is definitely worth the time. We took the ranger lead tour right down into the Indian ruins and we couldn't be happier. Saturday's in the summer are great as they have a nice farmer's market. We also went to Tequila's Mexican restaurant which was excellent. Very nice and clean park in the middle of town. Roads paved but sites are gravel. Not overpriced with full hook ups. Very quiet has some live ins but not trashy at all. Nice lady that runs it. We will go back if ever in the area. Nice shady trees with space in between. We camped at Sundance RV Park in a Motorhome. Staying here from June thru September. Check-in was easy, spot was reserved and all paperwork had been completed. Only had to process the credit card. The sites are all gravel and level. The roads are paved. The Shower/Laundry/Restroom is in the center of the park and convenient to all spaces. We were guided to our space and given help to back in. We got it perfect the first time. The park is on Main street and downtown is within walking distance. There is a large park across the street which has a public swimming pool. The stay has been pleasant. This is our 4th year staying here at Sundance. The place is very relaxing. We camped at Sundance RV Park in a Motorhome. The days were warm but the evenings and nights were very comfortable. There has not been much rain so the days are sunny and bright. They just added six new pickleball courts across the street in the park. The park is mostly geared for adults but there is enough entertainment close by for kids. What a pleasure to be here after camping in sun-filled parking lots, posing as campgrounds. The gravel is raked but we still had to use levelers. The staff were delightful - helpful in every way. 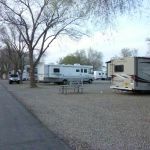 It is a quiet campground (even though it is in town) with both back in and pull though sites. There is a good many trees. The laundry has 6 washers and driers! Utilities, WiFi, and cable all perfect! The site was quite wide. We could park our vehicle next to our Airstream. Would definitely stay here again. We camped at Sundance RV Park in a Travel Trailer. Oh my! So much to see and enjoy! Mesa Verde National Park, Anastazi Heritage Center, Hovenweep National Monument, Pueblo ruins, etc. Driving, biking, kayaking all available. Shady, roomy sites. Better than average wifi. Nice park as a base to visit the many attractions in the area. Although there is a pet area, it is not fully enclosed so pets must remain on leash. Right on the Main Street through town, but minimal noise. We camped at Sundance RV Park in a Fifth Wheel. Canyon of the Ancients visitor center very well done and definitely worth a visit. Also, the Guy Drew Vineyards was a highly entertaining stop featuring good, reasonably priced wines and a charming hostess. Great place for a base camp to visit Mesa Verde and the many other parks in this area. We chose this park because it is midway between all the National Parks we wanted to visit in Utah and Colorado such as Monument Valley, Canyonlands, Archs, etc. In some case's it was a two hour car drive to the parks - but that is MUCH easier than moving the coach around - assuming you could even find a spot. Places like Arches and Moab are always filled and overpriced. The staff here is excellent and very helpful. The sites are all fairly level and most are treed enough that you may not get a good satellite signal. However, the cable TV and WiFi are very good. The only downside - it is a little difficult to enter the park from the main street when you are towing. However, they have installed a back gate which makes it very easy when you are leaving the park. We camped at Sundance RV Park in a Motorhome. Must go to restaurant next door. Super food and great prices. This Park is in downtown Cortez, very convenient to the entire town. It is about 10 miles from the entrance to Mesa Verde National Park. The Park is covered mostly with mature trees, but a few spots are clear for satellite service. Sites are gravel, but some spaces also have grass pads. Picnic tables, but no concrete patio. 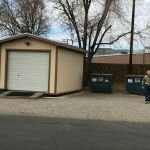 There is a laundry facility and Cable TV is included in the rate. There is WiFi, basic not high speed, but consistent. 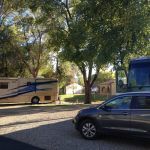 We camped at Sundance RV Park in a Motorhome. 10 miles from entrance to Mesa Verde National Park. Also, other National Monuments are nearby, Canyon of the Ancients and Hovenweep. Several other sites (4 corners, Ute Tribal Park) are driveable. Very nice campground right on Main Street of Cortez. Despite the location, there was very little road noise. The sites were good sized and shaded. We had grass and a picnic table on our site. Near the dumpster were containers for most recycling items. We camped at Sundance RV Park in a Motorhome. City Market is very close and has a great selection for grocery shopping. Also Safeway & Walmart in town. Convenient to visit Mesa Verde and for a longer stay in Cortez, the San Juan Skyway. Within a block is the best grocery store in town (City Market), Starbucks, the visitor center and two liquor stores. Thai Cortez has excellent food and the Casino has a $10.99 all-you-can-eat prime rib dinner! The real draw to this town is the cultural sites: Mesa Verde National Park, Hovenwheep NM, Canyons of the Ancients, several excellent museums and a number of festivals. The town is also the starting/ending point for the San Juan Skyway Scenic Drive...a must do! The people at True Value hardware are great. La Casita is a terrific Mexican restaurant and Safeway is the best, nicest grocery store. If you want to see Mesa Verde, make sure to see Far View and Lowry Pueblo also. You can walk around in those. La Cantina restaurant within walking distance (4 min) enjoy a great meal and some margaritas ! We drove to Mesa Verde National Park. Beautiful! This was a nice RV park. We did unhook our toad to go grocery shopping at Walmart which was just down the street. Did not have much time to explore Cortez since we were only there for the night and left early the next morning. We bought gas for motor home at Shell station near Walmart. Convenient to restaurants, convenience stores, shopping, fast foods...even within half block of a self service car wash! Mesa Verde National Park. Safeway, Walmart and City Market all close by. We ate at Tequilas and enjoyed our lunch. Mesa Verde, Anasazi heritage center, Canyons of the Ancients National Monument. Don't miss Mesa Verde! Ask the host to exit with your RV through the back exit, usually locked and open between 8am and noon, and you can get back on Main Street with a light. Mesa Verde NP is about 10 miles down the road. Walmart and Safeway are nearby. Mesa Verde National P entrance is very close to the park. very convenient shopping nearby, a quiet park yet close to everything. Mesa Verde National Park was 9 miles from the RV park. Lots of shopping including a Safeway and Walmart within one-half mile of Sundance RV park. Easy in and out of the RV park. Many RV accessible gas stations in the area. Great Mexican Restaurant down the road, next to the Days Inn. The Durango to Silverton Narrow Gauge RR is a must see as is Mesa Verde, Hovenweep, and Canyons of the Ancients. Four corners is strictly a tourist trap but we felt it was worth seeing since we were close. If you want pizza or Italian food we recommend Lotsa Pasta & That'ze Pizza restaurant. Excellent food. Convenient to Mesa Verde National Park. We ate twice at Jack & Janelle's restaurant, which has a walkway from the front of this RV Park. The food is much better than the appearance! Located just blocks from core of downtown, all necessary services and restaurants are very close by. Easy drive to Mesa Verde NP, Durango, Hovenweep, etc. Casita Cortez serves up some of the best, freshest Mexican. Their house Margarita was excellent, and salsa was almost to die for. The Colorado Visitor Center is 1/2 block away, just across the road. Go there to get your tickets for tours at Mesa Verde--you beat the crowds, and get better selection of times, etc. vs. waiting til you arrive at the park with the rest of the crowds. The Burger Boy Drive In just down the street offers some absolutely delish fast food - burgers as good as they get - rivals In-n-Out, minus the 'animal style' grilled onions. Do check 'em out if you're as big a burger fan as I am. Rear entrance / exit leads to a neighborhood road, then to highway at a traffic signal. Makes it much easier to enter the highway at the traffic signal. About 10 miles to Mesa Verde National Park. The city doesn't do a good job of trimming trees along mainstreet. Watch out for limbs! The Colorado Visitor Center is right across the street from the CG and it sells tickets for the Mesa Verde cliff dwellings tours up to three days in advance. PURCHASING YOUR TICKETS IN TOWN WILL SAVE YOU LOTS OF TIME AT THE PARK! We suggest that on your first day in Cortez you go to the Colorado Visitor Center - they open at 8a - that way there's no line and you will very likely get the tours and times you want. Close to so many places. Mesa Verde, Durango, Silverton, ride the San Juan skyway. Would stay there again. The town of Cortez has a few things to offer also. Excellent spot for NP visits. Across the street there is a large park with a playground and the Colorado Welcome Center. Very useful for travelers with kids or in need of tourist info. There is a dog park about a mile from the RV park. The Mesa Verde National Park main entrance is about three miles east of town but the main part is a 16-mile switchback-filled drive into the park. Tickets for ranger-led tours of cliff dwellings are available at the park's Visitor Center or the other visitor center in town. Allow more than one day to get a full sampling of Mesa Verde. Be sure to go to the visitor's center across the street, everyone is very helpful on things to do based on the duration of your stay! Huge amount of maps and information for any adventure! Rec center across the street was Great! Wonderful large outdoor pool with neat slides. There is also an indoor pool with 2 pools - one for smaller kids with slides & lazy river - the other pool has diving board and lap area. So many things to do around this campground. Good little restaurant next door. It's Cortez - lots to do. We visited Mesa Verde, Canyon of the Ancients and Hovenweep National Parks while here. Mesa Verda National Monument is a scenic drive with several pit houses and cliff dwellings. Several other parks in the area. Are you affiliated with Sundance RV Park ?